Here's a thought you might want to consider: with all the pedestrians and cars passing by, your front yard can be prime advertising real estate! Take advantage of this by propping up some yard signs on your lawn. You can use them to promote your favorite election candidate or upcoming events. 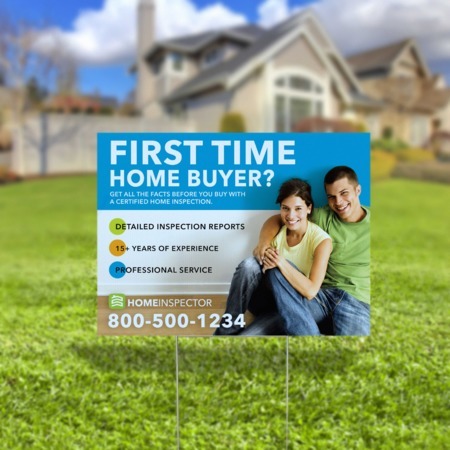 Yard signs are also useful for telling people to “keep off the grass”, not to mention a sturdy, all-weather way to let people know that your property is open for sale or rent. Our yard signs are made of durable corrugated plastic boards built to withstand exposure to water or weather variations. You also have the option to purchase H-shaped lawn stakes to keep your signs standing. Our large format inkjet printers can produce orders of 1-50 pieces per order at any size between 3x3” and 36x24”. The standard printing turnaround time is 1 business day for quantities of 1-5 and 2 business days for quantities of 6 and up, excluding shipping times. Small- and medium-sized businesses would find it difficult to afford paying for ad placements on TV, radio, newspapers or billboards. To market their.